Crab is an animal belonging to ten-legged crustaceans from infraordo Brachyura, which is known to have a very short "tail" (Greek: brachy = short, ura = tail), or whose stomach (abdomen) is completely hidden under the chest (thorax). The body of the crab is protected by a very hard outer frame, composed of chitin, and armed with a pair of claws. Inside the Brachyura include crabs, crabs and crabs. Crabs are found in all of the world's oceans. There are also fresh and terrestrial crabs, especially in tropical regions. Toko Hayati Fresh & Kepiting Soka Jakarta Frozen Seafood, a type of crab that is changing its shell, a term for crabs that are consumed in a state of skin that is still soft because it has just changed skin. Of course before consumption must be cooked first according to taste. 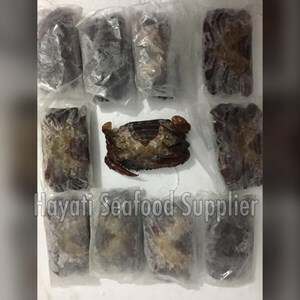 In the past, soka crabs when you bought only in the form of living necessities that must be processed immediately, but currently in big cities like Jakarta, many frozen seafood dishes in the form of frozen soka crabs are available in Jakarta's fresh and frozen seafood suppliers like us. Toko Hayati Fresh & Frozen Seafood Selling Kepoka Soka Jakarta frozen and fresh. Low fat crab meat, high in protein, and a source of minerals and vitamins. Soka crabs can be served in the form of shredded crab, rempeyek crab, or made with oyster sauce or black pepper sauce. This type of crab can be eaten entirely including its shell and claws because it is soft. The frozen food ingredients will last longer. Frozen food itself does not use any preservatives, this method locks the nutrients in it, it only needs to enter the refrigerator or freezer to stay durable but still healthy.